Hard wearing and practical. Will sit nicely on a shelf or desktop. Ideal for home and office filing. Perfect for A4 paper. 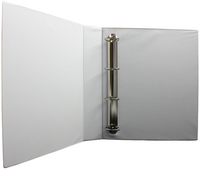 4-O ring mechanism keeps pages secure. Capacity: 40mm. Size: A4. Pack of 10. Approx Dimensions (CM): D50 W18.5 H33. Approx Weight (KG):4.3802.